The tax cuts referenced by Trump were signed by then-Gov. Mike Pence in May 2013 and included the immediate elimination of the state’s inheritance tax as well as reductions in the state’s personal and corporate income tax rates. 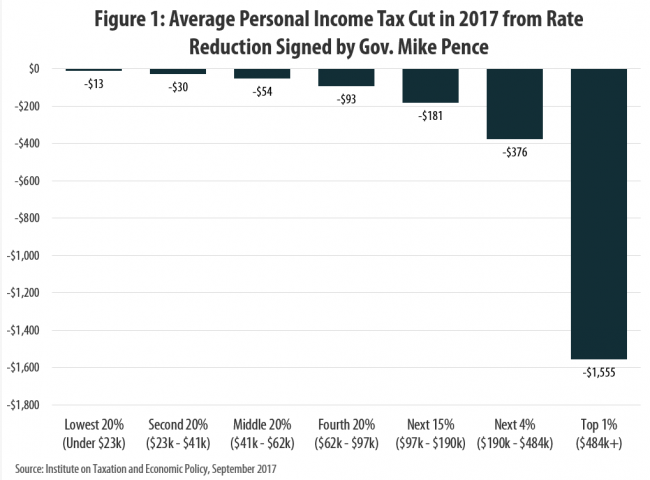 The personal income tax cut alone (from 3.4 to 3.23 percent) reduced state revenue by roughly $295 million this year and has contributed to Indiana’s unfortunate distinction of having one of the most regressive tax systems in the nation. As seen in Figure 1, families with incomes over $484,000 received an average personal income tax cut of $1,555 this year, compared to just $54 on average for the middle 20 percent of Indiana families (or approximately $2 per bi-weekly paycheck). The inheritance and corporate tax cuts were similarly tilted in favor of the state’s wealthiest families. In total, state officials estimate the cuts will drain at least $580 million from state coffers each year. Following the signing of these cuts, Indiana’s recovery from the Great Recession continued roughly in line with the rest of the nation. While the state’s unemployment rate has fallen somewhat more dramatically than the national average, the “higher paychecks” spotlighted by President Trump have not materialized. 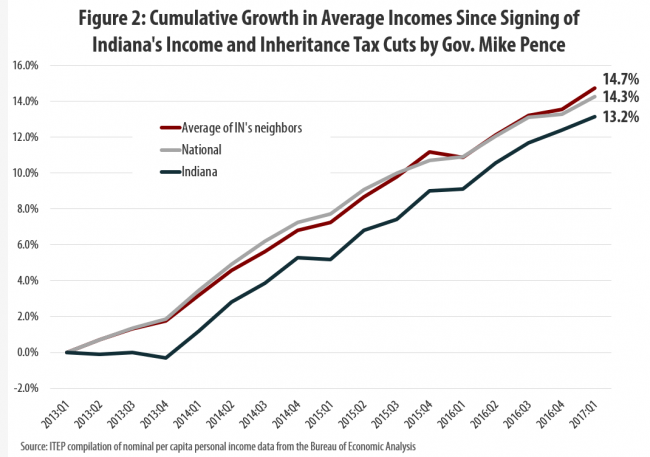 Since the signing of these tax cuts, average income growth in Indiana has trailed both the national average and the level of growth seen in neighboring states, as seen in Figure 2. Indiana’s recent economic performance, while better than some tax-cutting states such as Kansas, has not been particularly “tremendous.” Trump has argued that “it’s time for Washington to learn from the wisdom of Indiana.” But with officials such as Treasury Secretary Steven Mnuchin publicly asserting that their proposed tax cuts will lead to supercharged economic growth, it’s important to recognize that Indiana’s experience offers no evidence in support of such wild claims.